Take your design plan to the next level of innovation when you remodel with our selection of luxury vinyl flooring in Brandon, FL. G. Fried Flooring America offers responsive design assistance and floor coverings from many of the leading manufacturers in the industry. Start your design journey with a visit to our expansive showroom today. Choose a floor covering that allows you to do more with your existing décor. Each room in your home or business presents a unique challenge to any decorator. While solid hardwood is an excellent addition to rooms on the ground floor, it can expand and contract when exposed to the moisture of a laundry room or a kitchen. Our designers can identify a flooring product capable of providing you with the character of wood and the endurance of vinyl. Luxury vinyl offers greater give underfoot, and it won’t expand and contract the way that other flooring materials will when exposed to water. The manufacturer bonds a photo wear layer to the top of this vinyl product to give the customer a floor that is ready to endure the spills and thrills that come with an active family life. With the combination of functionality and appeal that comes with this advanced product, you can begin to broaden your ideas for the rest of your home. Through our 5 Star Selection system, the customer has greater control of what price protection guarantees and warranties they get. Customers in need of resilient flooring are sure to find a product that brings a room to life. Give your guest bathroom a modern look that is sure to boost the resale value of your home when you decorate with luxury vinyl plank flooring. You won’t have to sacrifice the look you want for the functionality you need when you shop at our local flooring center. 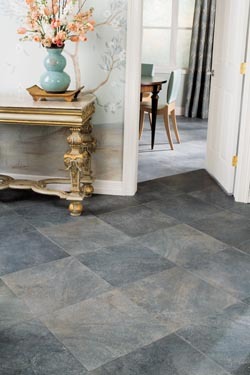 You are sure to get the best fit possible when you hire the right team for luxury vinyl tile installation. When you invest in new flooring for any type of interior, you need an assurance that the product will perform for years to come. Our contractors have the right tools and training for any challenging interior. You deserve flooring that makes every room more enjoyable. With luxury vinyl, you get the best of both worlds and a home that fits your way of life. Contact us today to start expanding the reach of your design plan with our selection of luxury vinyl flooring. We proudly serve customers in Brandon, Valrico, South Brandon, Riverview, and New Tampa, Florida, and surrounding communities.